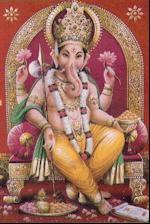 Lord Ganesha is the most widely worshiped Hindu God. Lord Ganesha is the remover of all obstacles. He is the Lord of the followers (Ganas) and therefore called Ganesha or Ganapati.He has a human body with the head of an elephant. The eldest son of Lord Shiva is also known as Vinayak ( knowledgeable ) or Vighneshwer (god to remove obstacles). He is worshipped, or at least remembered, in the beginning of any auspicious performance for blessings, success and auspiciousness. In his hands he carries a rope or paasam (to carry devotees to the truth to capture all difficulties.) an axe or ankusam (to cut devotees’ worldly’ attachments), and a sweet dessert ball /laddoo- (to reward devotees for spiritual activity). His fourth hand’s palm extends to bless people. He is considered a bachelor, but according to another school of thought, he has two Shaktis (consorts)- Siddhi & Buddhi. Siddhi represents prosperity and success. Buddhi represents wisdom. His vahana is a tiny mouse (mooshikam or minjur). Once goddess Parvati, while bathing, created a boy out of clay and assigned him the task of guarding the entrance to her bathroom. When Shiva, her husband returned, he was surprised to find a stranger denying him access, and struck off the boy’s head in rage. Parvati broke down in utter grief and to soothe her, Shiva sent out his squad to fetch the head of any sleeping being who was facing the north. The company found a sleeping elephant and brought back its severed head, which was then attached to the body of the boy. Shiva restored its life and made him the leader of his troops. Hence his name ‘Ganapati’. Shiva also bestowed a boon that people would worship him and invoke his name before undertaking any venture. 8. Ucchishta Ganapati: Blue colored image of six armed Ganapati with his consort. 26. Dundi Vinayakar: Four armed image of Ganesha bearing a tusk, a garland, an axe and a gem studded vessel. 27. Dwimukha Vinayakar: Red colored image of Ganesha with two faces and four arms. 28. Trimukha Vinayakar: Red colored image of Ganesha with three faces and six arms seated on a golden lotus. 29. Simha Vinayakar: White colored image of Ganesha with eight arms (with an arm bearing a lions face). 31. Durga Vinayakar: Red colored image of Ganesha with eight arms. Saivite Hindus believe that the story you gave about how Ganesha got his elephant head is purely a morality tale, and is not literally true. Indeed it has Shiva acting in ways that are contrary to his nature. It should be seen as a story about transformation and the futility of standing against God. In order to become closer to God we need to transform ourselves, which can be traumatic and mean cutting off things we have done or believed in the past. Just as Ganesha was given a great role after the transformation, what appears to be a painful loss will later be a gain. Thank you for the comment. I have a bunch of different versions about how Ganesha got his head but this is the most widely used one. In your opinion should I include more or just add to the post that many of the stories in the Vedas etc are meant to be studied philosophically and not be taken literally? I think it’s fine to just say that this and many other Hindu stories aren’t meant to be taken literally. I wouldn’t use the term “vedic story” unless you can define what it means. This story is not in the Vedas as far as I know, but it is an alegorical story that illustrates vedic concepts.